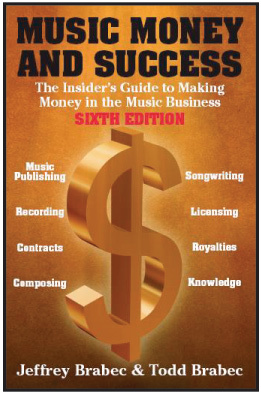 Every paid seminar attendee receives a free signed copy of "Music Money and Success" with paid admission! Todd Brabec, as Executive Vice President and Worldwide Director of Membership for ASCAP (the American Society of Composers, Authors and Publishers - the world’s largest music licensing organization) for well over 3 decades, was in charge of all ASCAP Membership operations throughout the world, all writer and publisher payment formula recommendations, changes and implementation, all advances, loans and other member financial arrangements and was responsible for signing most of ASCAP’s successful songwriters and writer/artists including James Taylor, Marvin Gaye, Metallica, Green Day, Smokey Robinson, Joni Mitchell, Neil Young, Journey, the Jimi Hendrix catalogue, Earth, Wind & Fire, Bob McDill, Jeff Lynne and Tom Petty as well as the blockbuster film and television composers James Horner (“Avatar”, “Titanic” - the 2 top grossing films of all time), Hans Zimmer ( “Pirates of the Caribbean” films), James Newton Howard (“Dark Knight”), Michael Giacchino (“Up”, “Medal of Honor” video games) and Randy Newman ("Toy Story" films), among many others. Jeff Brabec, is Vice President of Business Affairs for the Chrysalis Music Group (representing the catalogues of OutKast, Sheryl Crow, Gnarls Barkley, Danger Mouse, John Denver, Leon Russell, My Morning Jacket, Blondie, David Bowie, Paul Anka, Billy Idol, Jethro Tull,The Yeah Yeah Yeahs, A3 (The Sopranos television theme), TV On The Radio and Ray LaMontagne). He specializes in evaluating, analyzing, projecting income and negotiating music publishing catalogue acquisitions as well as songwriter, co-publishing, participation, administration, subpublishing and joint venture agreements. He has negotiated more than 1,000 movie, television, video, new technology and advertising commercial agreements for chart writers,writer-recording artists and writer - producers. Meet and network with industry professionals from various entertainment fields. Additional panels and presentations include Online Marketing, Music in Film, Television, & Video Games, Online Radio, Music Apps, and much more!